For 25 years, ambitious startups with promising computing architectures, accompanied by crystal-ball gazing researchers, have predicted the demise of mainframes. While these competitors steadily chipped away at the venerable system's market share, few IT shops with a heavy investment in the platform dared unplug their mainframes. And with good reason: Fueled by an estimated 220 billion lines of active Cobol code, mainframe environments run almost half of all banking systems. That makes mainframes responsible for roughly $1.5 billion worth of transactions a day -- not exactly an easy thing to unplug. Even so, many of these same mainframe loyalists now look to the cloud. With its promise of lower costs and the ability to easily access and transfer massive volumes of on-premises data, cloud computing could provide an increasingly appealing alternative to the mainframe environment. "It's true that the applications companies run on it are business-critical and, in some cases, too expensive to convert," said Tom Nolle, a TechTarget contributor and president of CIMI Corp., an independent consultancy specializing in telecom and data communications. "On the other hand, I don't think I have talked to a user recently who thinks that further investment in mainframe technology would be a good strategic decision." Annual mainframe system sales have declined from a high of about $4 billion earlier this decade to $2 billion in 2016, accounting for just 3% of IBM's total revenue. Even so, the associated hardware, software and technical services accounted for nearly 25% of IBM's sales and 40% of its overall profit in 2016, according to Bernstein Research. "We have been signifying the death of the mainframe for a couple of decades. It is almost as long a [forecast] demise as that of General Francisco Franco," said Geoff Woollacott, principal analyst with Technology Business Research. "Big iron is old and archaic, but it still has utility." IBM, the overwhelmingly dominant force in the mainframe market, is determined to resist this emerging threat from the cloud. It wants to make the mainframe more relevant in conversations about digital transformation, ones that typically focus on cloud and mobile technologies. In January 2015, IBM debuted its z13 Systems mainframe. It was designed to handle billions of mobile transactions from a wide assortment of mobile devices, including Apple's iPhones and iPads. That marked the first time the company rolled out a mainframe environment tuned to handle mobility, analytics and the cloud. It not only could handle billions of mobile transactions, but it also cost IBM $1 billion over five years to develop. Next, in July 2017, came the z14 Systems mainframe, loaded with pervasive encryption capabilities and aimed at large corporations ever fearful of hackers getting at their most sensitive data. The new technology offers end-to-end protection of in-flight data and APIs traveling over networks with the aid of encryption keys locked into cryptographic hardware. Big iron is old and archaic, but it still has utility. The added security could further enhance the z14's image as a trusted repository for a large corporation's most important data by making it easier to meet the range of complex compliance regulations both in the U.S. and overseas. "Pervasive encryption should be particularly interesting to the global banks and other financial institutions who conduct business worldwide," said Charles King, president and principal analyst of Pund-IT Inc. "Even if hackers break into a system, they can't do much unless they come with something capable of breaking 128-bit encryption," he said. The z14 is also IBM's fastest mainframe -- company officials claim the unit's 10-core CPU chip is the fastest in the industry. It can perform 12 billion encrypted transactions per day on a single system and has three times the memory capacity of its predecessor, the z13. This sort of computing muscle is intended to appeal to professionals accustomed to the specialized capabilities of a mainframe environment. IBM included support for a number of new technologies, including containers. The new machine can host two million Docker containers. IBM also took steps to ensure the z14's machine learning analytics is more accessible to both individuals and large product development teams across an enterprise. Called Machine Learning for zOS, the new capability can carry out federated analytics across both z-based and non-z-based systems. 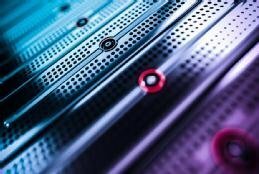 Based on interviews with 10 IT organizations with heavy investments in mainframe environments, a recent study from IDC -- sponsored by CA Technologies and IBM -- suggested that the mainframe has reached an inflection point: The system will either remain merely a revenue-supporting machine, or it will play a significant role in the digital transformation projects now underway in many of these larger companies. Which path the modern mainframe takes depends on how well IBM connects the system with users' existing or future web services and service-oriented architectures, thereby allowing mainframe environments to more efficiently deliver data to distributed applications. In the report, some IT professionals said they deployed both Linux and Java as a way to lower development costs. "An important aspect of modernizing on the mainframe is the use of Java," said Peter Rutten, a research manager with IDC's enterprise platforms group. "Most organizations in the study say they will support -- some aggressively so -- Java on Linux, while others will do so in a limited fashion by running Java inside Customer Information Control System." An advantage -- but for how long? Not everyone sees the strategic long-term value of mainframes -- either for customers or IBM. They believe the glory days of the mainframe environment can only be seen in the rearview mirror and that user time and money are better spent elsewhere. "What IBM is trying to do is slap a Band-Aid on a seeping wound," CIMI Corp.'s Nolle said, referring to the z14 Systems mainframe. "They are in a market that is never going to be a growth market again," he said. If IBM hopes to gain a competitive advantage through the use of pervasive encryption, Nolle concedes that the mainframe is the best platform on which to do it. He suspects, however, that voracious competitors such as Amazon will use more modern cloud-based offerings to chip away at Big Blue's technical advantage. "Every major competitor will try to erode the security benefits [of the z14 Systems mainframe] by coming in with something that will be not as good but just good enough," Nolle said. "Those offerings in the very least will lengthen the sales cycle of competitors' product lines and make life more complicated for IBM's mainframes." Surprisingly, mainframes provided some of the only upbeat news in IBM's overall server hardware numbers for last year's fourth quarter. While revenue for the quarter for all server hardware totaled $2.5 billion, a 12.5% dip compared with the previous year's fourth quarter, z Systems revenues grew by 4%. This growth was spurred mostly by users interested in deploying the z13 to handle mobile transactions, IBM said, as well as the arrival of new workloads such as blockchain in mainframe environments. While he is skeptical about the mainframe's future commercial success, Nolle said he is heartened by IBM's decision to return to its "geeky roots" and start pushing the technology envelope again with z14. "I had this IBM notebook from the 1960s, and on the front, emblazoned in gold, was the word think," he said. "IBM got to be IBM by thinking, but over the past 10 years, it lost its way. What they are trying to do now is to think again." Are there technologies that you see as legitimate rivals to the mainframe environment?